This box can be a great place to put treasured things throughout the years. That special rock or feather can be kept safely out of the way in this personalized storage box. Sand and prep the box. Paint the box inside and out with two coats of Medium Yellow, sanding lightly between coats. Make sure to include the trim on the bottom and the edge of the box top. Using the ¾" (19mm) stencil brush, lightly pounce Winter White onto the box top and bottom. Do not pounce on the trim. If you get too much white on the box, go back and pounce more yellow over the top. Allow the box to dry, then pounce Lemon Custard over the white. This will give you three layers of color. Use the ½" (12mm) flat brush to paint Green over the yellow trim on the top and bottom of the box, but paint lightly enough to allow some yellow to show through. Paint the squares and the circle with Lipstick Red. After they dry, sand the edges and recoat. Paint the letters and the doll head with Purple. After the paint is completely dry, lightly sand the edges of the letters and the doll head to create a distressed finish. Glue a red square in the centers of each side and the circle in the ce3ntger of the top, using wood glue. 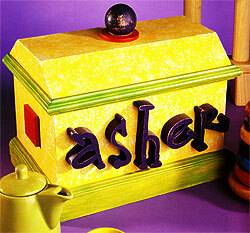 Now adhere the doll head to the top of the box and the letters to the front of the box. Spray the box with matte spray sealer for protection.